Nigeria’s most spectacular music stars have vowed to make the forthcoming Glo Mega Music Nationwide Tour the best entertainment experience for fun seekers. The nationwide show which begins at the Marble Arch Awka in Anambra State on Saturday, April 15 is featuring most of Nigeria’s brightest and best musicians. Globacom calls it the best thing to happen to entertainment industry in Nigeria in a long while. Omawumi, Korede Bello and Di'ja. The show will go round a total of 27 cities across the country. Globacom's also added that it would, in the course of the tour, added another mega star in the Nigerian Music Industry as a surprise package. “You know we are show-stoppers”, hinting at what they have in store for fun-lovers at the mega show. Apart from Awka, the Glo Mega Music Nationwide Tour is also slated for Ikeja, Ikorodu, FESTAC and Ajah all in Lagos; Awka; Owerri; Asaba; Calabar; Enugu; Aba; Suleja, Kubwa and FCT, all in Abuja; Port Harcourt; Ibadan; Ijebu Ode; Abeokuta; Ekpoma; Kaduna; Akure; Lokoja; and Anyigba. 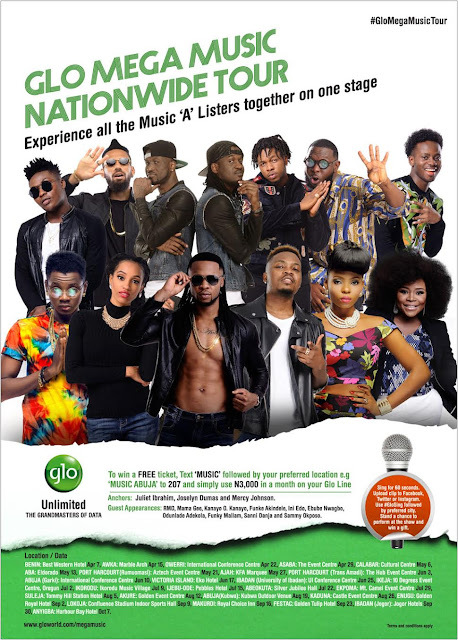 To qualify to be part of the Glo Mega Music Tour, subscribers are required to use a minimum of N2,000 within one month before each show and text “Music” and their preferred location to a short code, 207. For instance, a subscriber who wants to attend the Awka show needs to send by SMS, “Music Awka” to 207.